The BIT’s Front of House workers help run the theatre’s box office and assist the theatre’s visitors with ushering, fire-marshalling and general event duties. 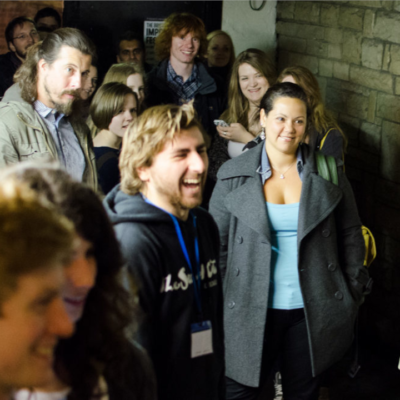 The front of house is the perfect place for those who want to be at the heart of the theatre, meeting and getting to know BIT’s varied and vivacious audiences! The BIT’s Front of House Volunteer Team are a dedicated band of volunteers who perform front of house duties to support the BIT as non-profit social-enterprise objectives. The BIT welcomes all applications from friendly and reliable individuals to its Front of House Volunteer Team to strengthen a vital part of our growing, wider volunteer community. As a volunteer front of house team-member, you will operate the BIT’s Box Office, performances spaces and facilities during events. You will receive training in ushering, fire marshalling, cash handling and customer service. Finally, after everybody has been settled (including those pesky latecomers) you can sit back and enjoy the show! If you have registered to be on the Front of House team* and have received a volunteer contract for the position (and accepted! ), then we’d love you to come and join us for an induction session! It’s important that you attend one of these every six months, so we aim to keep them relaxed and informative. *Participants may also complete an application for during the training day itself.